The Monster Squad. Home Box Office 1987. I’ve often said I wanted to try watching a movie completely cold, without knowing a thing about it. I’m not sure I knew this movie existed before yesterday. Apparently it has something of a cult following. Sean, the leader of a grade-school club of monster lore aficionados comes into possession of a diary kept by Abraham Van Helsing concerning an amulet of pure Good which holds the forces of Evil at bay, but may be destroyed by Evil one night every hundred years. Van Helsing attempted to use the amulet to banish the Evildoers to Limbo, but failed. Now, with the diary and Amulet hidden in America, Dracula is assembling his Evil forces to once again try to destroy the Amulet and rule the world or something like that, and the only ones who can stop him are the Monster Squad kids. 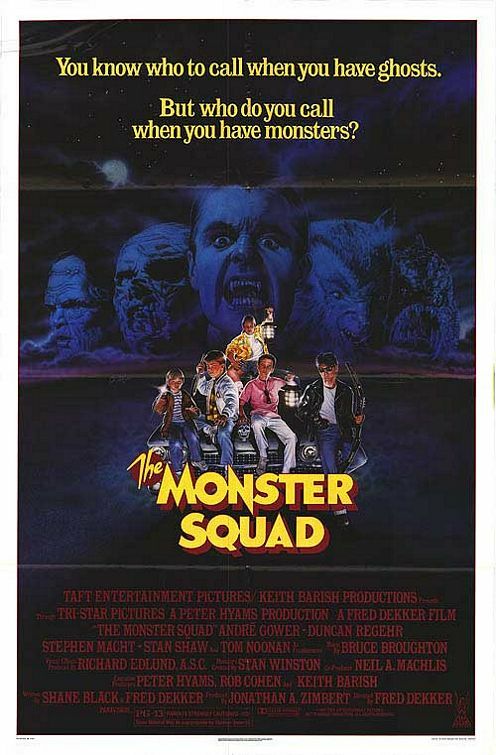 This is rather transparently a Classic Movie Monster Mashup (Dracula’s gang includes the Mummy, Wolfman, Frankenstein’s Monster, and even the Creature from the Black Lagoon), but it’s not setting out to be anything other than goofy fun with familiar monsters, so it works. They’re modern takes on the monsters, with some great design work in them, and interesting character choices. At least one and a half of the monsters aren’t really evil, and Dracula as the heavy and the ringleader seems to be the only one who really wants to do much more than just survive. The formula for an Eighties Kids’ Gang Movie is well established by this point, and the kids slot into archetypal roles without much extra character around them. The ones who aren’t the Fat Kid (actually called Fat Kid by some), the Cool Older Kid slumming with them, or the young ones tagging along blend together without anything to define them. There are of course some aspects that don’t age well, but a lot of it comes down to “it was what being a kid in the 80s was like”. Sean’s parents are having trouble making their marriage work, but I think it comes off as more petty and one-sided than intended, since the main bone of contention is that Del is a police detective and can get called into work at any time, and Emily gets angry at him for not being at home whenever she wants him. It also gets comedic mileage out of the fact that supernatural rites always require a virgin, which may have been new at the time (though I’m sure some movie would have commented on it in the 60s or 70s), but is pretty old by now. This is a simple bit of fun with archetypes. The gang of kids were a bit bland, but the iconic monsters got a slight refresh while remaining icons. It’s a good romp, but I think its staying power is a “you had to be there” type of phenomenon.